An outstanding junior sportsman from Bundoora, Paul Rizonico was almost 15 when he was first invited to the junior squads of the Collingwood Football Club. For a time, he balanced his football talent with cricket, as a representative of the Australian under 19s cricket team. Football won out in terms of his passion, and Rizonico spent three seasons with the Under 19s side before looking a realistic chance to play senior football in 1983. But he suffered a broken nose after he “tangled” with St Kilda hard man Robbie Muir in a practice match before an on-going groin complaint curtailed his career for several seasons. It wasn’t until Round 20, 1986 – when he was 20 – that Rizonico finally made his debut in black and white, against Hawthorn at Princes Park. He missed his coach Leigh Matthews’ phone call on the Thursday night before his first game, having gone out to watch a few of his mates play tennis. Rizonico had 15 touches in his first game, kicking a behind, but the Magpies lost the match by 72 points. Yet he did kick two goals the following week in the club’s win over Richmond. He managed 12 games in 1987. His best performance came against Footscray in Round 5, when he had 24 disposals and kicked a goal, being named third best behind James Manson and Terry Keays. That year he also shared the Joseph Wren Memorial Trophy as reserves best-and-fairest along with Mark Beers. His last season at Victoria Park in 1988 resulted in only three games late in the season, taking his career games tally to 17. Frustrated by a lack of opportunities, the 22-year-old left Victoria to sign with Port Adelaide in the SANFL, where his former Collingwood coach John Cahill was in charge. It was a sort of a homecoming. He had been born in Port Adelaide hospital and lived his first 10 years in South Australia before moving to Melbourne with his parents. Rizonico’s impact with the SA Magpies would be significant. He played 102 games; would become a dual premiership player (1990 and 1992) and a life member of the club (2014). He was also a long-time staff member of Port Adelaide, acting as an interchange steward among other roles for the AFL club. Importantly, he was one of a number of mentors for a young footballer on the rise during Port Adelaide’s 1992 SANFL premiership season. 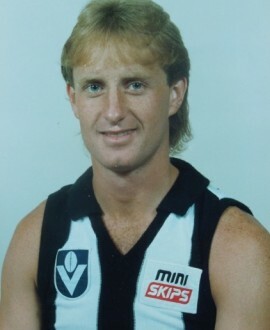 The young player’s name was Nathan Buckley.